Reconstruction / Illustration by Peter Schouten. No living mammal is more peculiar than the platypus. It has a broad, duck-like bill, thick, otter-like fur, and webbed, beaver-like feet. The platypus lays eggs rather than gives birth to live young, its snout is covered with electroreceptors that detect underwater prey, and male platypuses have a venomous spur on their hind foot. Until recently, the fossil record indicated that the platypus lineage was unique, with only one species inhabiting Earth at any one time. This picture has changed with the publication of a new study in the latest issue of the Journal of Vertebrate Paleontology that describes a new, giant species of extinct platypus that was a side-branch of the platypus family tree. The new platypus species, named Obdurodon tharalkooschild, is based on a single tooth from the famous Riversleigh World Heritage Area of northwest Queensland. While many of Riversleigh's fossil deposits are now being radiometrically dated, the precise age of the particular deposit that produced this giant platypus is in doubt but is likely to be between 15 and 5 million years old. "Monotremes (platypuses and echidnas) are the last remnant of an ancient radiation of mammals unique to the southern continents. A new platypus species, even one that is highly incomplete, is a very important aid in developing understanding about these fascinating mammals," said PhD candidate Rebecca Pian, lead author of the study. 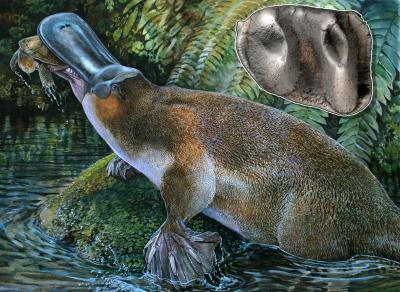 "Like other platypuses, it was probably a mostly aquatic mammal, and would have lived in and around the freshwater pools in the forests that covered the Riversleigh area millions of years ago," said Dr. Suzanne Hand of the University of New South Wales, a co-author of the study. "Obdurodon tharalkooschild was a very large platypus with well-developed teeth, and we think it probably fed not only on crayfish and other freshwater crustaceans, but also on small vertebrates including the lungfish, frogs, and small turtles that are preserved with it in the Two Tree Site fossil deposit." The oldest platypus fossils come from 61 million-year-old rocks in southern South America. 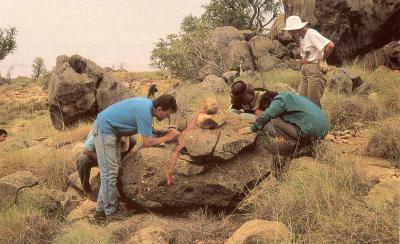 Younger platypus fossils are known from Australia in what is now the Simpson Desert. Before the discovery of Obdurodon tharalkooschild, these fossils suggested that platypuses became smaller and reduced the size of their teeth through time. The modern platypus completely lacks teeth as an adult and instead bears horny pads in its mouth. The name Obdurodon comes from the Greek for "lasting (obdurate) tooth" and was coined to distinguish extinct toothed platypuses from the essentially toothless modern species. "Discovery of this new species was a shock to us because prior to this, the fossil record suggested that the evolutionary tree of platypuses was relatively linear one," said Dr. Michael Archer of the University of New South Wales, a co-author of the study. "Now we realize that there were unanticipated side branches on this tree, some of which became gigantic." The specific epithet of the new species, tharalkooschild, honors an Indigenous Australian creation story about the origin of the platypus. In the Dreamtime, Tharalkoo was a head-strong girl duck inclined to disobey her parents. Her parents warned her not to swim downriver because Bigoon the Water-rat would have his wicked way with her. Scoffing, she disobeyed her parents and was ravished by Bigoon. By the time Tharalkoo escaped and returned to her family, the other girl ducks were laying eggs, so she did the same. But instead of a fluffy little duckling emerging from her egg, her child was an amazing chimera that had the bill, webbed hind feet, and egg-laying habit of a duck, along with the fur and front feet of a rodent -- the first Platypus.